perfectly enhances its stability,high-polished edge protects your devices from scratch. 1. This is a 1-coil wireless charger and charge at standard wireless charging speeds (about 3-4hrs). 2. Please note that it is normal that the temperature of your device would slightly rises while wireless charging. 4. Using your device while charging or misaligning the device and charger may cause higher temperatures.It will charge better when you align the charging pad to the center of your phone. 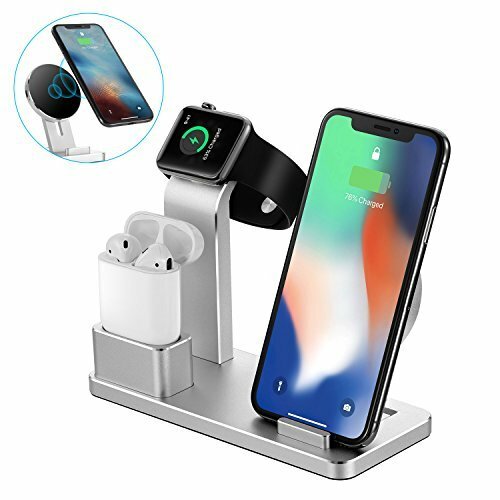 4 in 1 Multi-function: Not only works as a stand for Apple Watch, AirPods,cellphone,tablet,but also a wireless charger and Charging Stand. The best designed angles hold your watch, phone, AirPods tight and sturdy, and perfectly hides your charging cables under the stand base, keeps your desk neat and tidy. Detachable and Safe: It comes with a detachable and ultra compact charging pad, can be detached from the stand and carry on for charging anywhere. Making your charging more safer and convenient ever with over-voltage protection, temperature control, foreign item detection. Solid and Elegant: From 430 grams body weight to its high-polished edge, the charge stand is optimized to protect your devices from falling down due to gravity,organize your phone, watch and AirPods,and prevent them from scratch. Premium aluminum alloy with refined polishing provides comfortable tactility and elegant appearance. Wide Compatibility: Universal for Apple Watch Series 3/ Series 2/ Series 1/ Nike+ / Sport / Edition / 38mm/ 42mm; Apple AirPods; iPhone X / 8 /8 Plus, Samsung Galaxy Note 8/S7/S6 Edge and all Qi enabled devices.